WikiLeaks has released a cable that reveals the US Government held a series of top-secret meetings with David Rockefeller over where to hide the elite family of the Shah after the Iranian revolution in 1979. 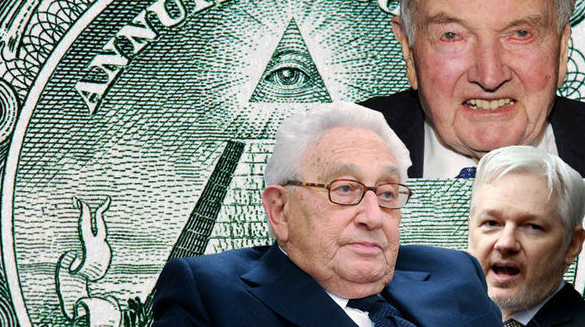 The release, which details top-secret dealings between then Secretary of State Henry Kissinger, and tycoon David Rockefeller, adds rocket fuel to one of the longest running conspiracy theories – that the US Government is actually run from behind the scenes by a shadow government who take orders from a secretive global elite known as the Illuminati. The Rockefellers are an American industrial, political, and banking family that made one of the globe’s biggest fortunes in oil from the late 19th century. John D Rockefeller and brother William Rockefeller made this primarily through Standard Oil. The family then went on to control Chase Manhattan Bank and is considered the most powerful familiy ever in the US. Conspiracy websites list the Rockefeller family as one of 13 top Illuminati dynasties and claim they are attempting to install a New World Order upon the Earth, which would ultimately be one global Government controlled by them. Kissenger and Rockefeller were said in the document to “specifically discuss Mexico, the Bahamas and possibly Argentina” as asylum options and made contact “with several people in the US” to look at “places in Central and South America“.